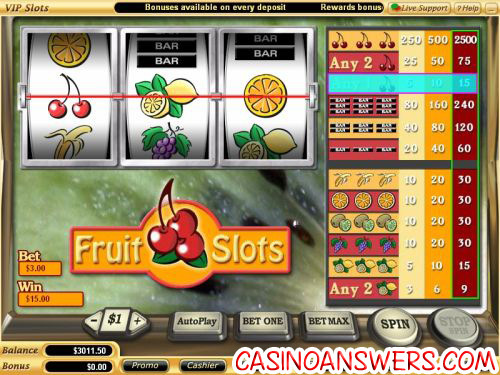 Fruit Slots Classic Slot Guide & Review - Casino Answers! Fruit Slots is a classic 3-reel, 1-line multi-coin slot machine. You can play Fruit Slots at any online casino on the Vegas Technology platform, including VIP Slots Casino and Online Vegas Casino. The music on Fruit Slots is very tropical. There’s also an ambiance that goes along with the music that gives the slot machine a casino setting. Spin the Fruit Slots reels and you will get a very classic slot machine sound effect, with the reels spinning and then “bings” when they stop. If you hit on a winning combination, you will hear an energizing sound effect with the effect of the coins dropping. Fruit Slots coin values are $0.10, $0.25, $0.50, $1, $5 and $10. Once you have selected your coin value, you must choose if you wish to bet 1, 2 or 3 coins. To bet one coin, hit “Bet One” once; to bet two, hit “Bet One” twice; to bet three coins and spin the reels automatically, hit “Bet Max.” The top jackpot is 250X for one coin, 500X for two and 2500X for three coins, thus Casino Answers suggests you play with all three coins. You don’t want to be the person who hits three cherries and only win 500 coins. Fruit Slots has an autoplay feature with several different options. In Spin Settings, You may choose your number of spins (5, 10, 25, 50, 100, 250 or 500), number of sections between spins (1, 1.5 or 2). In Stop Settings, you may leave it on the default option of not stopping until all your spins have completed, to stop when the jackpot is won, stop if a win exceeds or equals a selected value ($50, $150, $200 or $250), to stop on any win, or to stop if your credits are increased or decreased by a selected value ($50, $150, $200 or $250). You may stop autoplay at any time by hitting the “Cancel Autoplay” button. To make your spin on Fruit Slots, simply select your coin value, bet however many coins you wish and hit the “Spin” button. You can let the reels stop automatically or you can hit the “Stop Spin” button during a spin to manually stop the reels. If you get a winning combination, you will hear the coins coming out of the machine (not literally!) and your win will light up on the paytable. All of the potential winning combinations in Fruit Slots are listed in the paytable to the right. The most common win is two lemons, which can pay 3-9X your bet. 3 lemons will win you 5-15X. 3 bananas, oranges, kiwis or grapes will win you 10-30X your bet. Single bar symbols will win you 20-60X your bet. Double bars win 40-120X. Triple Bars win 80-240X. One cherry will win 5-15X, and is a very common win. 2 cherries will win you 25-75X. Finally, the top jackpot of 3 cherries will win you 250-2500X your bet. Make your to make the max bet at your coin value to greatly maximize your potential wins. Fruit Slots makes for a very simple, yet classic slot machine that many online casino players will enjoy. You can get $777 free on your first three deposits to play Fruit Slots and plenty of other games over at VIP Slots Casino! I’m a USA casino player. Can I play Fruit Slots at VIP Slots? VIP Slots Casino is a US-friendly casino and does accept players from the United States. For more details, you can read our in-depth VIP Slots Casino Review. Where can I find Fruit Slots tournaments? In that case, you may want to check out Online Vegas Casino, where you can get four free tournament coupons just for signing up. Online Vegas Casino runs lots of slots tournaments, many of which are Fruit Slots tournaments. Does Fruit Slots have a progressive jackpot? No, Fruit Slots does not have a progressive jackpot. That said, there are other slots over at VIP Slots Casino such as Mega Money Mine that do have a progressive jackpot. What classic slot machines are there? What Fruit Machine slots are there at online casinos?